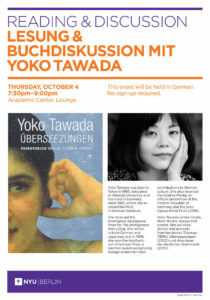 On Thursday 4 October, NYU Berlin will host a reading and discussion with author Yoko Tawada. Yoko Tawada was born in Tokyo in 1960, educated at Waseda University and has lived in Germany since 1982, where she received her Ph.D. in German literature. She received the prestigious Akutagawa Prize for The Bridegroom Was a Dog. She writes in both German and Japanese, and in 1996, she won the Adalbert-von-Chamisso Prize, a German award recognizing foreign writers for their contributions to German culture. She also received the Goethe-Medal, an official decoration of the Federal Republic of Germany and the prestigious Kleist Prize (2016). Yoko Tawada writes novels, short stories, essays and poems. She will read stories and excerpts from her books Talisman (1996), Überseezungen! (2002) und Abenteuer der deutschen Grammatik (2010).